Argh! this is NOT the series I'm talking about! Regrettable but true: there is only one American context for the idea of a North/South divide, and it always involves the Civil War. But I’m not going to talk about this 1985 series, nor am I going to talk about Patrick Swayze. Argh! What was the BBC thinking in coming up with this uninspired DVD cover? 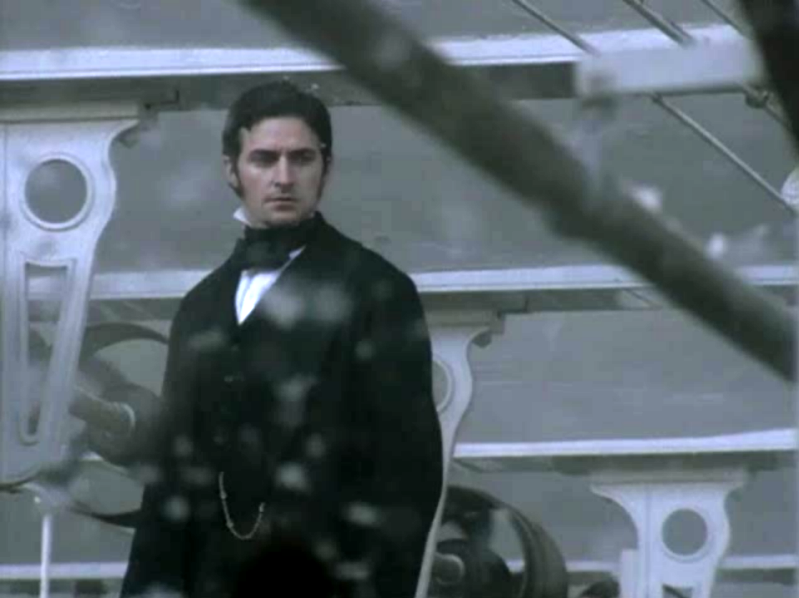 My North & South has a much more appealing male lead — Richard Armitage, who’s being celebrated at the center of this FanstRAvaganza — I mean, nothing against Swayze, but Armitage leaps off the screen in this, his breakout role. But I also want to get to a broader subject: how the series seems to address real and abiding social problems, the most overriding of which is the conflict between middle-class morality and an Adam Smith style “the market takes care of us all” ideology. It’s surprisingly hefty for a period drama, and I get absorbed every single time. 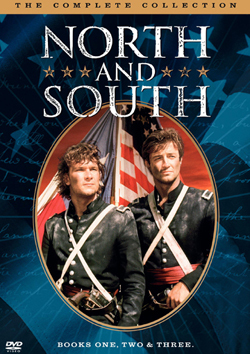 No wonder Americans don’t know the real North & South: the series never appeared on American television. This 2004 BBC series is based on the 1854-55 Mrs. Gaskell novel about the differences between the pastoral, patriarchal English South vs. its gritty, individualistic, industrialized North. Doing itself no favors, the BBC reproduced it using an uninspired DVD cover with lackluster photographs of its stars that belies the series’ high quality. Despite a campaign spearheaded by fans of the series’ star Richard Armitage to air the series, American PBS has thus far resisted — and thus, most of my peers have never heard of the series. That’s where I come in. I have recently acknowledged to myself that I am an evangelist for North and South. Who doesn’t enjoy spreading the good news about something that seems practically a secret? But when I think about it, I suspect I protest too much. After all, isn’t teaching is a kind of missionary work? “This semester I am going to sing to you of the virtues of finding love, truth, meaning, and happiness in the form of cultural anthropology!” you might say to the assembled 250 students on the first day of class. Maybe I’ve always been an evangelist — and now that I think about it, I’m quite certain that I’ve tried to school people at cocktail parties with the 1001 reasons why they should be watching The Wire, and probably with the same unblinking religious fervor of those poor saps who knock on my door, wanting to talk about my immortal soul. 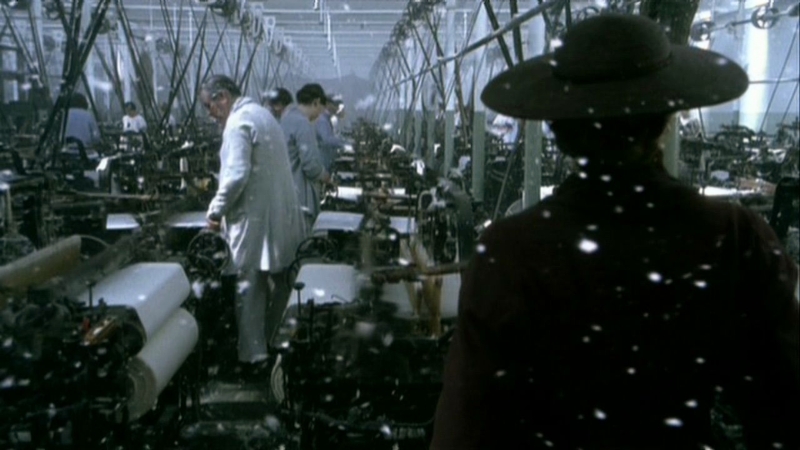 When I talked my Texas next-door neighbor into watching North and South with me, she was silent through the first 30 minutes or so until we got that glimpse of Mr. Thornton in the mill, looking down on the workers at their looms. “Oh, yeah,” she said approvingly. Considered solely for the romance between Thornton and Margaret Hale, you might say it’s a more serious version of Pride and Prejudice insofar as we watch through the heroine’s eyes as she hates him at first sight and reluctantly but completely changes her mind throughout the course of the show. It’s not an easy sell. I’ve seen the series about 12 times and each time Thornton’s early brutality, as well as his strange subsequent self-revelations about his family’s past, make him an oddly moody brute of a man. Armitage is so good in this role. It’s the first thing that leaps out at you. We like Margaret (Daniela Denby-Ashe) right away — who wouldn’t, with those slightly sleepy eyes and arched eyebrows? — but she remains a far more private, unknowable character. Even if you layer on everything you know about nice middle-class girls in the mid-19th century, it’s hard to know what she expects for her future. When I finally got around to reading the Gaskell novel, I wasn’t surprised to find Thornton the protagonist and Margaret the sphinxlike, closed-off character whom he adores. Thornton’s waters run deep and he does, indeed, “have a temper,” but somehow we come to trust the guy. Chalk that up to Armitage’s capacity as an actor. My most successful inductee to the religion of North & South is Servetus, who became the Armitage super-fan and blogger – but it wasn’t watching it with me that did it. We had a great time watching, mind you. It was late summer and school hadn’t started yet, and it was a chance to forget the hellishness of the upcoming semester. It was at the end of that semester that she borrowed a dvd copy from a colleague and spent a good deal of that winter watching it over and over that made her realize what a terrific actor Armitage is, and it got her started on following his career so closely. When she posts an image like this (a recent one, from Recognise Magazine), I can only feel that my job as an evangelist is complete. You’ve got to admit — isn’t that just about the most beautiful man you’ve ever seen? Just recently I showed the series to a group of three academics I met here while on my research leave, two of whom I’d met at a holiday party back in December — people I’d grown closer to during Downton Abbey season. None of them had heard of North & South, nor had they read the book. They grew quiet as we watched the rest of the first two hours, at which point we took a break. Harry had made a fairly extraordinary trifle for dessert, so we spooned out lovely big globs of whipped cream, fruit, and rum-soaked cookies. He then asked about Richard Armitage. Within five minutes he had not only finished off his own portion of trifle, but had updated his Facebook photo as Mr. Thornton, and had done several searches for more images of Armitage. “He’s going to appear in The Hobbit!” he squealed, and Merry and Ursula clapped their hands with delight. [See here for La Loba’s photos of locations, BTW.] When we sat down for the final two hours of that plot — the drama of Frederick’s appearance and departure; the growing body count; that marvelous moment when Margaret leaves Milton forever and, from his upstairs window, he begs her to “look back at me!” — my friends burbled with approval. Some of my friends (aka “unsuspecting targets”) are taken aback by the darkness and seriousness of this series, particularly because at first glance the story deals with labor conflicts and social misery so much more serious than that in Downton Abbey. And the clothes, sadly, are just not as luscious. (That latter series seems so much more like a trifle, whereas North & South is more like a hearty boiled pudding.) But it’s the seriousness that ultimately appeals. Also: Mr. Thornton has excellent sideburns, which my new friend Harry has replicated in the weeks following our viewing. When she left, Ursula said, “Would you mind if I borrowed the dvd? I’d like to think about whether I can use this in a class next year.” The rest of us teased her, but she wouldn’t be the first to find good use for it with undergrads. I’ve got only one more thing to say about my newly-acknowledged role as an evangelist for North & South: costume dramas were meant to be watched in groups. My history with costume drama goes way back: when I was a kid during the early 80s, my mom and I got in the habit of watching virtually everything Masterpiece Theater had to show us. 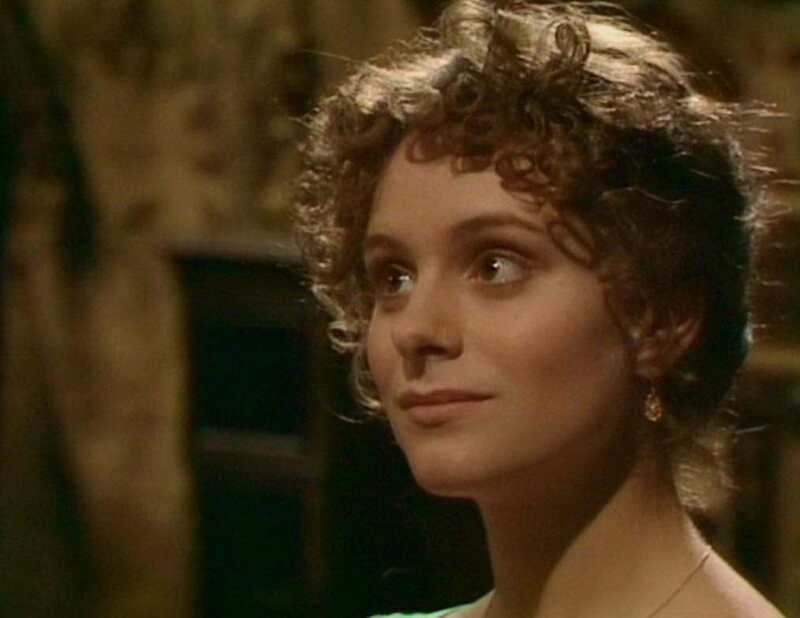 The first of these — and therefore most memorable to me — was a BBC miniseries version of Pride and Prejudice (1980) with the wonderful Elizabeth Garvie as Lizzie Bennet (above) and David Rintoul as Darcy. I’m always so conscious that when I write this blog, I do so anonymously — yet part of the pleasure is trying to find the right style and voice to allow you to know me. I’ve confessed all manner of odd things about myself here, but the real way I open myself up is not by giving you clues about my identity but by showing you my voice, the voice I show only to my close friends. So here’s what I want to suggest: find someone new to show North & South to. It’s easiest to spread it out over the course of a couple of nights (4 hours, after all, is a lot of TV) but mix it up with some nice food and drink. Enjoy those rare light bits of humor, as when Thornton and his mother share a wry laugh at Fanny’s expense. Cheers to all the FanstRAvaganza people out there! In particular Phylly3, who like me is writing today about her experience as a fan of Armitage. Check her post out below, as well as many other writers’ experiences! So ultimately this is all your fault. Rad! Welllll….she didn’t become Servetus immediately. Perhaps I should term it a “gestation period.” It takes more than a single viewing to create a Servetus, after all! I started giving N&S as housewarming gifts, Christmas gifts, Birthday gifts, thankyou presents, etc. Some of these are to people who live out of state, so I couldn’t actually twist their arms and make them sit down and watch it. A few family members waited weeks — even months, before they sat down to watch it. But when they did — they were all converted. Thanks for the fun post. What a great idea! and how generous! You’re going to have some people who really, really want to be your best friend after realizing what a great gift this is! I was a convert before I saw N&S. 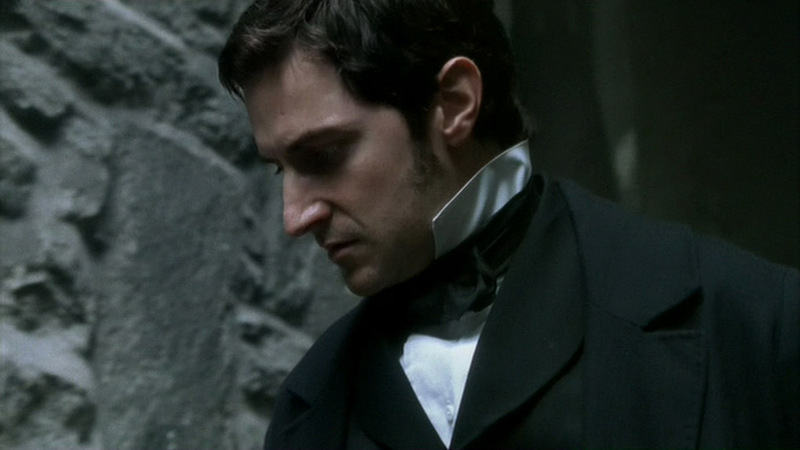 I’d heard all about Richard Armitage’s Thornton and I was not disappointed when at last I found the DVD. I watched it in one sitting, then watched again with my elderly mother, and then with my husband. Each person enjoyed different aspects. Returning to watch it for FanstRA purposes, I was amazed at the amount of work that went into the production from locations,sets, costumes and props. Moreover, the research Richard Armitage did for this role is indicative of his dedication as an actor. Isn’t this terrific? And I can say I’m wondering whether my friend Harry will join in the FanstRA love, considering how much he was impressed with RA during our viewing! I read the novel not long after seeing the series for the first time, and you’re exactly right about how much work they put into this series. They drew enough different things from the book that it would have taken quite a vision from the screenwriter & director to create such a great piece. you converted a MAN. My hat is off to you. And it has everything to do with Richard Armitage. I just emailed him to tell him about the Spooks seasons with RA, because I suspect he might enjoy that series (and Armitage’s gift for looking good in a dark blue shirt and/or tattoos). Yum. I am impressed that you are such a successful evangelist for RA and for North & South. You did a wonderful job with Servetus 🙂 Maybe one of these days I’ll corner someone I know in RL and talk them into watching North & South with me. Watching in groups is the best! We formed a Downton Abbey watching party that religiously joined up every week with cocktails and snacks, and usually spent 30 minutes afterward debriefing. It was hilarious and wonderful at building community. One of our group just broke down in tears when Anna and Bates finally got married. So yeah, N&S viewing party. It’ll make you watch the series again with fresh eyes. I’m in this doctrine, religion, fandom! It’s sort of fun to call it a religion, eh? And who would have thought it would come with such joy? Ana Cris probably would have thought of it — she has a really open attitude to what a religion could be, and she’s always finding symbolic connections between things. I like the idea of it as a religion as opposed to an illness, which is how I’d been thinking of it. Nice to meet you too, Nat! yeah, I don’t get people who don’t get it. I guess you have to be like Didion. She’s enthusiastic but she doesn’t ever push. “Oh, yeah” is what I said when I first saw Richard Armitage in The Vicar of Dibley. However, that was immediately followed by North & South. And yes, RA is about the most beautiful man I’ve ever seen. You were way ahead of me — most Americans haven’t seen Armitage, or at least not until I spread the word to them via this series. I never saw Vicar or anything else of his till I got converted. I’d love to say it was watching it with me that created the Servetus we know and love, but actually that occurred 6 months later when she borrowed the dvd from a friend and had the chance to watch it over & over. She often gives me more credit than I deserve. Have you seen Wives and Daughters? it’s not a patch on N&S, of course, but is wonderful for a lazy sunday afternoon’s viewing. Ahhh, the pleasure of a good series. . . I wish we were watching one now. I think you introduced me to that one too — ahh, Francesca Annis, whom I will never think of again without having the hairs on my neck stand up a little bit. WHY are you not with me here? Do you realize the people we could convert to this religion if there were two of us knocking on doors, etc.? I really need to see that one. Wonderful post about one of my absolute favorites. When Mr. Thorntons beauty hit me like a ton of bricks, I knew that Mr. Darcy had been dethroned! I wrote a post a while back about lending my N&S DVD to a friend (I had purchased a backup copy just in case I couldn’t bear to be parted with it…) and she was disappointed! It turned out the silly willy didn’t pop in the second disc and her N&S ended with Thorntons rejection LOL! People, don’t stop watching till you see kisses with tongues!!! Clearly none of my inductees would dare say they were disappointed. Never! 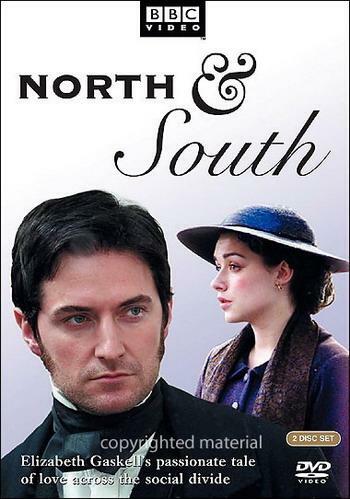 Love North and South – could watch over and over! Read the book for my book club and I do recommend it, but this is one case in which I love the movie even more. I’m telling you, it makes for an interesting avocation, all the evangelizing. But let me assure you: everyone is grateful for the good news! Great post, I am always trying to convert my friends to a bit of RA love. Leant my copy to a friend recently and bullied her until she watched it. She and her husband watched the whole thing in one night and loved it! Two down, hundreds to go! That’s the attitude, rosiepig! Never be discouraged! Think of it as another opportunity to enjoy the series! Excellent! I love the idea that there are other evangelists among us! A lovely post. 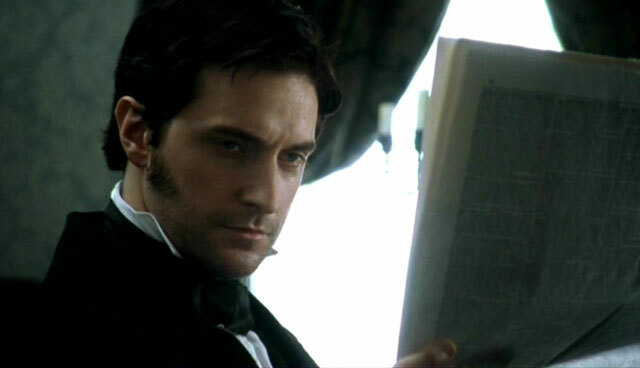 N&S was also my introduction to Richard Armitage–after renting it at our local library. And actually, it was the cover with Thornton and Margaret on it alluding to a romance–and then reading the synopsis on the back–that clinched the decision for me to give it a go. I lovely costume dramas with strong heroines in crinolines and men in cravats. And oh my! In the two years since, I have enjoyed more of Mr. Armitage’s storytelling–that has now inspired my own storytelling. P.S. I’m in Illinois. And I have yet to find someone here whom I can converse with about RA. But I loaned my sister his Dibley dvd over Christmas and she liked the show. But she broke one of my Downton Abbey dvds watching it so many times. Ha! Ah well, at least I have my online RA Fan friends. Broke it! Oh dear! I’m going to have to be careful who gets to borrow my copy! There’s nothing better than feeling that you’ve discovered something, is there? I think that’s what makes my evangelizing so much fun. Clearly you are being called to become an evangelist in Illinois if no one there has any idea who you’re talking about! Superb post! I’m a recent convert to RA love; I haven’t watched N&S as often as you did, but it amazes me that every time I watch it, I notice different interesting aspects of it to ponder. Any advices to convert friends who don’t have much knowledge background in costume dramas or British history of that period ? N&S book and DVD are not available in the bookshops here. Whew — good question! I have no idea how to get them except by mail order, and we all know how complicated that can be. I would hope that the love story and the conflict between morality and good business sense that’s at the heart of North & South would appeal to people with no expertise in British history at all. After all, virtually all cultures require students to read classics of their national literatures. But I say you give it a try with your friends and see whether they get it. And let me know if your evangelizing works! A wonderful post Didion and congratulations on your continued efforts to spread the love and admiration for Richard, keep up your converting work with a passion. My few efforts have started with the VOD and then when asked for more have loaned very happily North and South, The Impressionists and recently Strike Back. (I now have loan copies and my keep copies so I am never without) Through spending hours and hours in a car travelling with company have converted several passengers to audiobooks after them listening enthralled to Lords of the North. I feel like that’s the sign you’re totally engaged in evangelization: you own more than one copy of it so you don’t have to sacrifice either your own sanity or your evangelization efforts. I love it! I know someone else in TX who was converted to the N&S religion, and she too bought two copies — only to get teased mercilessly by me. But what would I do if I discovered a crack in my copy, and there was some kind of shortage on dvd replacements? Why, there would be a major international crisis, that’s what. Thanks for this amusing, even hilarious, post! That’s just fantastic. Why not show the whole thing? I’ve always wondered what students might be able to do with an assignment that asked them to compare a full text with its miniseries version. Your comment reminds me again how much I wish I taught English literature — it’d give me such great opportunities to evangelize even more. Nice blog post, Sister Didion! Might I suggest you buy yourself a Ford van and travel the country spreading the word about North & South (homage to Cold Comfort Farm). I’m the one who ran the campaign to air N&S on PBS – I still have some postcards left! Nothing ventured, nothing gained. !!! A Ford van, y’say? Now, to develop my message vis-a-vis the burning fires of hell! Oh, how I love that show. It is just SO rude that PBS is ignoring our pleas. Thanks so much for starting this campaign — perhaps eventually it won’t just be me evangelizing for the living word of North & South, but all the many clear-eyed adherents created by PBS. I love it, North & South evangelist is a great calling! I’ve convinced a few people to watch it with me. While they enjoyed the story, they didn’t become as passionate about it or about Richard Armitage as I am. I better plead the 5th on that. This is a beautiful post — and it’s interesting that N&S has become such a locus of sociability for you. It totally squares with one of the many things that makes you so beautiful IRL — your love and thoughtfulness about your friends. Aww, jeez, Servetus, you’re making me blush! Just passed my copy to a work friend today — a woman whose partner is out of town for the week and she’s feeling bereft. I only wish I had the time to go over and watch it with her. I wasn’t “evangelized” either. I had never heard of RA before Dec. 2010 when I just happened to see N&S on our national TV website. I was a life-changing experience! Since then I’ve seen just about everything RA has done.I’m more and more convinced that he is THE greatest actor. I have tried to convert some people, with hardly any success. They liked the series but weren’t impressed by RA in any special way. How vexing about these un-impressable types who don’t feel the RA love. A total mystery, if you ask me. But I’m so jealous that you managed to find N&S on your own and then find your way into this amazing world of RA fandom! Perhaps I see it so much as a social activity because I was evangelized by my grad school friend, and because Servetus has become such a whirlwind of RA activity. Seems so lonely to be out there, alone, enjoying him only by oneself. Guess I’m going to be watching this alone on Netflix download. I’m thrilled, even though it will be a solitary pleasure. Thanx for the good recommendation. Oooh, Hattie, four hours of viewing pleasure. It almost makes me want to give you my phone number so we can debrief midway through! And you’d never guess that such a snarky feminist would have so many ties to fan blogs, would you? Clearly my house has many rooms! I try to evangelize stealthily. I lend my ‘spare’ copy out when I can. No one else has fallen under the same spell. Sigh. I think Gaskell’s story is much more interesting than P&P, which everyone knows. Thanks to all of you sharing the love! Okay, my favorite, favorite thing about this RA fan fest is the discovery that I’m not the only one to be an evangelist! So happy to hear that you’re stealthily doing the good work, too. And I’ve discovered so many people have two copies of N&S — this is making me think I’m a fool for not having a spare. Truly,you are a great evangelist,you gave us Servetus! Interesting… I guess what I had was a “gestation period” too! I would have commented sooner but I have Gravatar problems with my phylly3 avatar. So I am using Facebook instead. This comment made me laugh so hard — I’m going to have to discuss with Servetus the strange sexual overtones involved in my evangelizing process! Was it WordPress that gave you trouble re: posting your comment? Because you know, I’ve had problems with other blogging sites (BlogSpot especially) when trying to post comments to other sites. I’ll let the WordPress people know if you’re having trouble. As far as I recall Servetus and Didion were completely chaste during the initial view of N&S. We did indulge, however, in alcohol and Whole Foods chocolate truffles. That is our story and we are STICKING TO IT. The “implantation” of the Richard Armitage seed occurred ENTIRELY without physical contact. Honestly. Late stopper-by here, but I also wanted to say ‘thank you’ for being such a good friend to Servetus during (what sounds like) some really, really dark and evil times. I had my own ‘Didion’ when I watched N&S – she’s a history grad student (my housemate at the time) and she handed me a stack of BBC DVDs when I was pretty down on working in London and considering a repatriation to the US. I was going to ask if you knew bccmee, but then I saw her comment. I love her image work with RA and I love that I’m not the only N&S nerd around. Ahh, RA you drag us all in… Thanks for the post and the great pics! cheers, Spooky! And you’re so right that bccmee and Servetus have drawn so many of us in to the RA love! Just discovered North & South and now hubby is watching it with me. Let the conversion begin! Hooray! A new convert!! Welcome, Morrigan.